Slippery Rock borough officials are taking the next steps toward developing the Gateway Park property. Council members on Oct. 17 agreed to advertise for bids for the project, which will update the park and add parking spaces at 100 S. Main Street, where the vacant First National Bank building stands. Bob Bowser voted against the motion. In a meeting that lasted about three hours, council members approved the remaining design details as presented by Gateway Engineers Inc., Pittsburgh, the borough’s engineer. They also reviewed the timeline of the project starting in 2015, when they had been hoping for someone to come forward with plans to develop the property. Several residents also spoke, sharing their continued concerns about the project. “Everything has been rushed,” Itzi Metzli said during John Trant’s presentation. Trant is a planning consultant for the borough and the Gateway Park project manager. During public comment, Metzli said he was not in favor of council seeking bids for the park and parking lot. He urged council to slow things down until the building has been demolished. That part of the project is set to start in early November. Russ Karl said that because the demolition bids were lower than expected, that extra money should be used to pay down the loan that the borough has approved – and not on extra “bells and whistles” for the project. Council members on Sept. 19 approved a contract for $99,320.25 with Minniefield Construction, Pittsburgh, for demolition. It was the lowest of eight bids received, and demolition had been budgeted at $298,650 based on estimates given by a few contractors, Trant has said. Chuck Brochetti echoed Karl’s concerns, saying he is worried about the loan. The project itself costs too much, and it’s fiscally irresponsible to glamorize that property, he said. The borough will soon close on a 20-year loan with FNB for $750,000. It will be no higher than $1,173,500, Trant said. That amount includes the $450,000 NextTier loan that the borough previously secured for the property purchase and demolition, the parking lot and park upgrades, and loan interest. Trant led a PowerPoint presentation and had copies of multiple documents related to the project – engineer reports, demolition details, meeting minutes, and more. Since the beginning, the main goal of the project has been to demolish the building, maintain and add public parking spaces, and enhance the downtown business district, he said. The borough had been leasing the public parking lot behind the building from FNB. Borough officials were worried that another buyer could eliminate the public parking spots. Other options were explored, but they did not work out. An engineer’s report shows that the building is not in good shape; a pharmacy was interested in the property in 2016; and a senior living facility was discussed in 2015. Slippery Rock Development tried to help market the property. SRD is a nonprofit group that helps support, enhance and revitalize the downtown area, said Bill Sonntag, chair of SRD. The project has been discussed multiple times at regular and special council meetings in 2016 and 2017, giving lots of opportunities for public input, Trant said. ”There have been rumors of lack of transparency,” he said. Metzli said that taxpayers were not given the chance to say what they’d like to see on the property before the $450,000 loan was approved. Then the cost was upped to $750,000, which he said was not recorded in meeting minutes. ”A lot of this was done in secrecy,” he said. Gene Allison also feels that council hasn’t been transparent throughout the whole process. How the public is notified about certain things is a common concern, Trant said. He has advised council to do what is legally required, like placing public notices in the Butler Eagle. He also said that the cost estimates and ideas for developing the property have been publicly discussed, and public feedback has been considered. Trant noted that some property purchase discussions happened in executive (private) session, which is permitted. “This is after the fact,” Karl, said referring to the interaction between residents and borough officials at the Oct. 17 meeting. Council President Regina Greenwald said that during regular council meetings, they are not required to answer questions on the spot. Minniefield has until March to wrap up demolition, and they are responsible for asbestos removal and the remaining contents, which include the large bank vault, Trant said. The borough sold office furniture and other fixtures online, and about $20,000 worth of items have been donated to Slippery Rock Community Library, Slippery Rock Community Park, and Slippery Rock Volunteer Fire Company and Rescue Team, Greenwald said. The borough sent surveys to 42 business and property owners in the Main Street business district, and 24 of them were returned. The responses were generally supportive of the project, Trant said. Metzli asked why the demolition bid opening date was changed from Sept. 15 to 14, wondering if it was a “deliberate attempt” to keep information from the public. Trant changed the date because of his own scheduling conflict, and the borough was legally required to notify only the interested bidders. “That process is about the bidders, not the public,” Trant said. It has been challenging to develop the property and keep public parking, and the borough has explored other funding options through the U.S. Department of Agriculture and Butler County, but they were not feasible, he said. The borough will post information on its website about when demolition will begin, Greenwald said. For more information, please visit here. Council and Gateway Engineers finalized the bid documents, addressing details about the clock, James Myford sculpture, welcome sign, light poles, benches, and more. The parking lot will include 23 additional spaces, and some changes will be made to Gateway Park to spruce it up. The cost estimate for that part of the project is $350,000, and there are a few items and alternate bids that can be tweaked to make sure it does not go over budget, said Nicole Oeler, a landscape architect with Gateway, and Dan Deiseroth, a project engineer with Gateway and the company’s executive vice president. During public comment at the end of the meeting, Scott Boyer said that the project will not attract new Slippery Rock University students or new businesses, and the space will be underutilized. 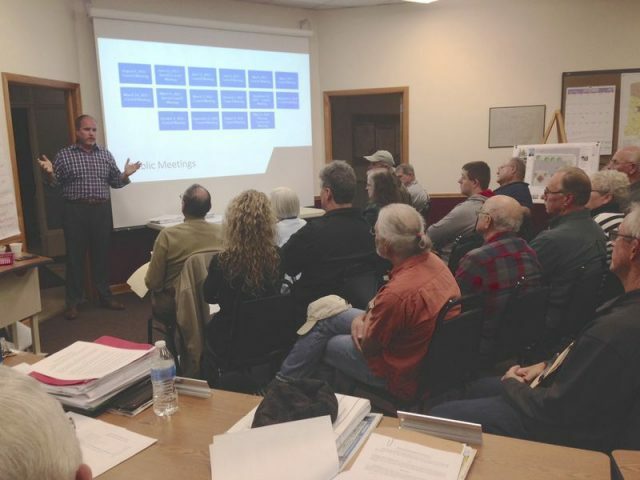 • Council members approved the final land development plan for Slippery Rock Community Library’s new building, along with the developer’s agreement. The plan, recommended by the planning commission for approval, had been revised because the square footage of the building was changed. The construction bids were higher than expected, and the library board decided to go with the 2,400-square-foot option with a patio and 800-square-foot foundation for a future addition. They were initially interested in a 3,200-square-foot building, and those plans were already approved. The new building site is at 465 N. Main Streer, and it will cost about $750,000. • Council members briefly discussed the proposed budget for 2018. The projected income is $1,192,064, and expenses are estimated at $1,182,384, Greenwald said, later noting that there is no property tax hike being proposed. Current rates are 24.375 mills. Salary increases are being recommended for the borough administrator, Lucinda Lipko, and her assistant, Kristina McCullough. Greenwald told council members to study the draft budget, reminding them that it is not a public document. If council is ready, they can vote at the Nov. 7 meeting on adopting the preliminary budget. That meeting starts at 7:00 p.m. at the borough building. Once it is adopted, the public will have a chance to review the spending plan, Greenwald said. • Trant reported that the borough’s finances and accounting practices are in good shape. He recommends the addition of a capital improvement fund to help streamline the budgeting process for expenses like new police cruisers or road improvement projects.